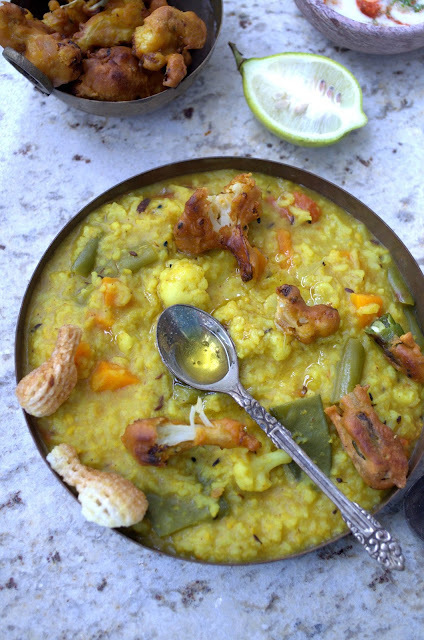 Khichuri Bhog is a much revered term in a Bengali household as it is an offering made to God during Durga Puja, Lakshmi Puja, Kali Pujo, Swarasti Puja to name a few. Bhog Khichuri is prepared other than festival times too. Same khichuri when prepared on other days tastes different when served with a variety of accompaniments. The mere mention of Khichuri Bhog instantly conjures up the distinct flavour of Gobindo Bhog Chal. Which brings out the true essence of Khichuri. Bengal's very own premium variety of rice which is aromatic and full of flavours. 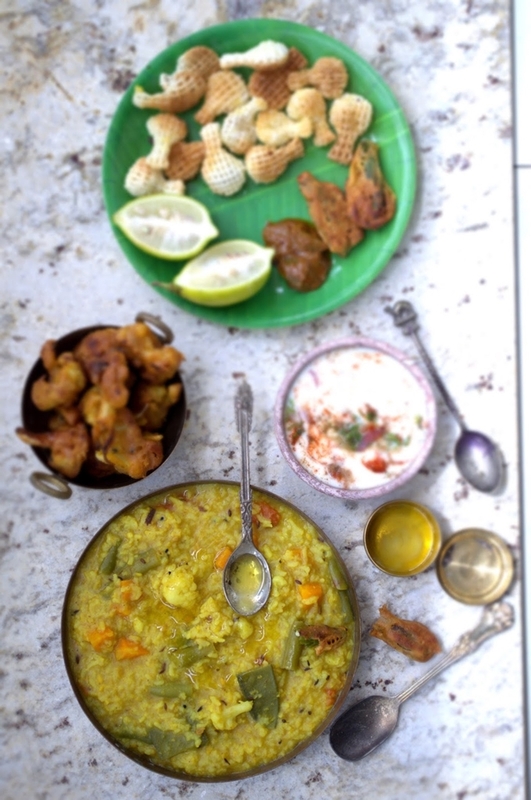 A rainy day and a steaming plate of Khichuri along with Ilish Mach Bhaja is something to die for. One can experiment a whole lot of accompaniments besides Chutney and Papad. Being a one pot meal facilitates preparation time and can be cooked with or without vegetables. Wash and soak rice. Dry Roast yellow moong dal till it leaves nice nutty aroma. The color of roasting dal should be light in color, over roasting may bring out different taste. Take a heavy kadhai, boil the roastedd al along with 2 cups of water, salt and turmeric. Allow the dal to cook partially. Now add rice with another 2 cups of water, stir it well. Let it come to boil, gradually add the vegetables, crushed garam masala, cumin powder, salt to taste. Simmer for 8-10 minutes to get the desired consistency. And the vegetables should be cooked till tender. Remember khichuri tends to get dry so the consistency should be monitored (smoothly porable). Neither too thick nor too runny. By this time, rice-dal and vegetables will be cooked. Add 1 tsp of sugar and mix thoroughly. For seasoning heat ghee in a frying pan, add tej patta, red whole chili, panch phoron, grated ginger in this sequence. Pour it over the piping hot khichuri and enjoy it with phulkopir pakora, raita, aachar and papad. 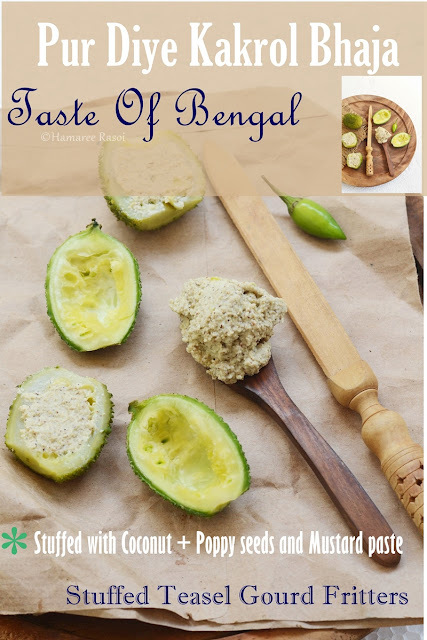 read more.. "How To Make Bengali Khichuri | Bengali Bhog er Khichuri Recipe"
Kakrol Bhaja or Bhaji is our summer special side dish which we devour with steamed rice and daal. Be it summer, winter or rainy season some kind of Fritter / Bhaji is a must for our lunch or dinner time meal. In our childhood we never had to pay any heed to instructions like "don't have fried item daily" or "Eto Tele Bhaja Khash !" We sisters were as thin as wafer, so we never compromised on our daily dosage of Bhaja. Be it Aloo bhaja / Phulkopi bhaja / Sheem Bhaja / Maach bhaja / Kumro Phool Bhaja to name a few. No, we don't get Kakrol in my part of world, but that doesn't stop me from relishing it. 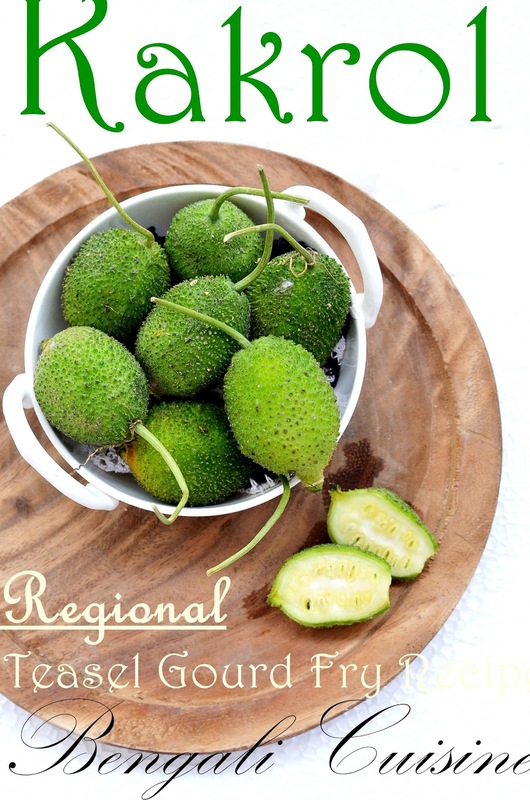 This summer I carried all my fav vegetables from Kolkata to Chennai and Kakrol was top on list. For this recipe we first boil, then slice them vertically. 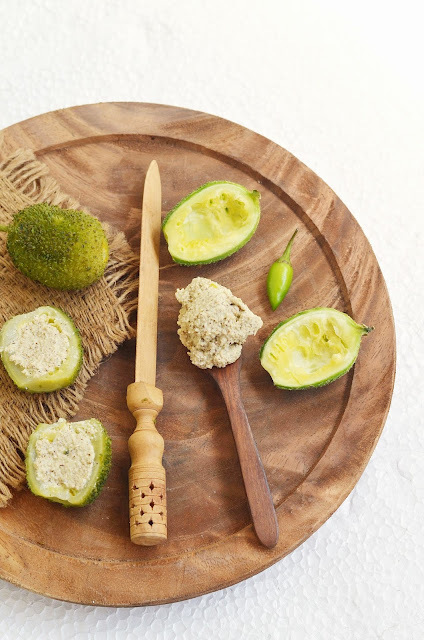 Gently scoop out the seeds to be filled in the center with the mixture of Coconut + Poppy seeds and Mustard paste. Later dip in a batter made of rice flour, besan and some spices. Deep fry till golden brown. 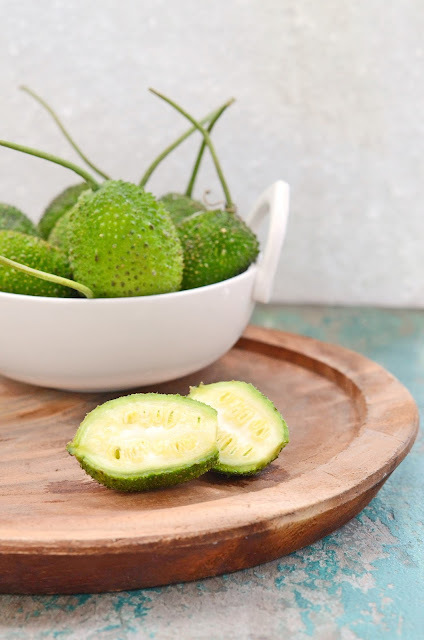 Scrape out the rough surface of Kakrol (peeler is a great help), Boil them with little salt in an open vessel with adequate water till it softens. Cut them lengthwise and scoop out the seeds. Make a thick paste of grated coconut, mustard seeds, green chilies, poppy seeds along with little salt. 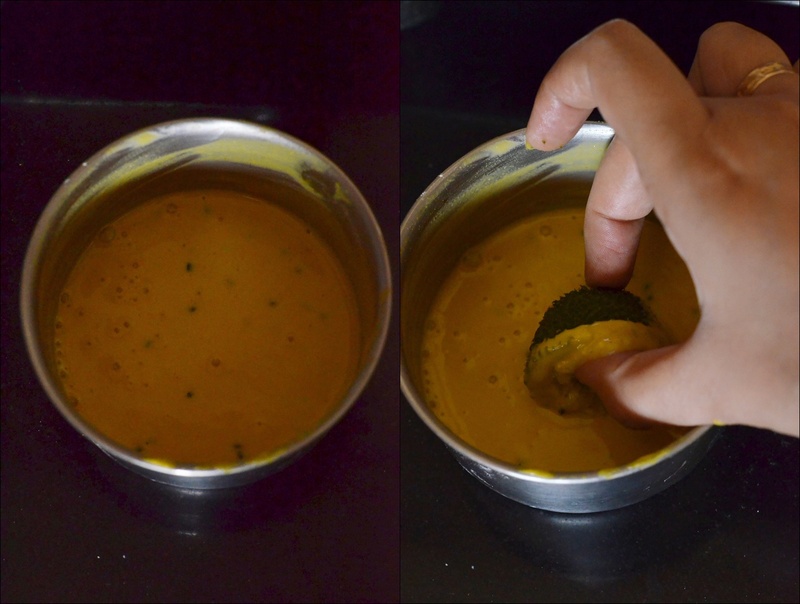 Transfer it to a bowl and pour mustard oil to some zing. In a mixing bowl, mix gram flour, rice flour, salt, chili powder and add few water spoons at a time to make a thick batter. Make sure there are no lumps and keep aside. Fill the boat shape hollow kakrols with the coconut-poppy seeds paste and keep the remaining ready in a plate. Heat oil in a frying pan and once smoke starts coming out, reduce the heat. Take 1 tsp piping hot mustard oil from the frying pan and add it to the batter. Mix thoroughly. 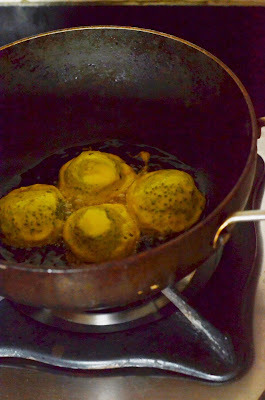 Dip each stuffed Kakrol in batter, it should cover the kakrol thoroughly and then deep fry them till golden brown. While frying just remember not to fry 2-3 kakrols at a time. Frying should be done on medium heat and do flip them regularly. Serve the stuffed kakrol fry hot. We generally have Kakrol bhaja with Dal-Chawal. 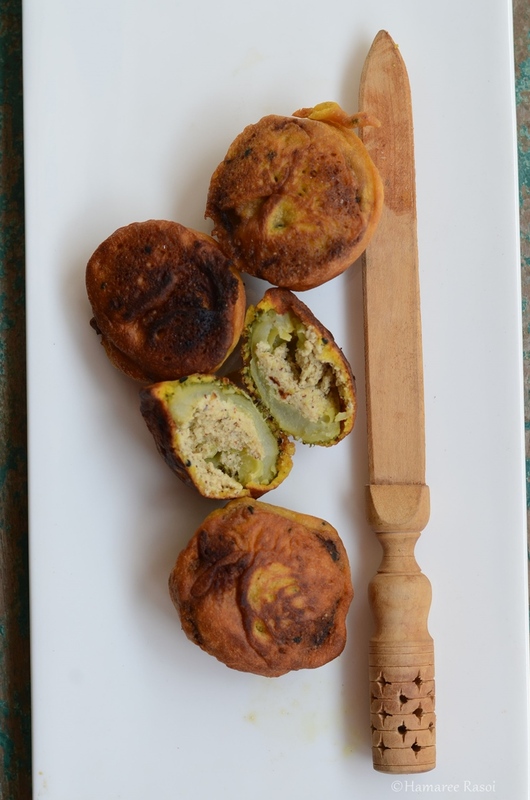 read more.. "Pur Diye Kakrol Bhaja | Stuffed Teasel Gourd Fritters "